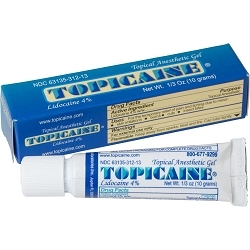 TOPICAINE ® topical anesthetic: skin numbing gel for a vacation from pain. Available with 4% or 5% lidocaine. 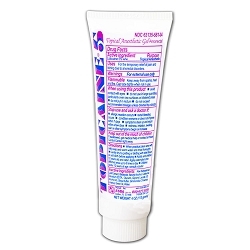 This lidocaine numbing cream GEL will numb the skin for one full hour at max strength. Non-greasy formulation easier to wipe off than numbing creams or ointments. The aloe vera and jojoba oil will leave your skin feeling smooth, soft and moisturized. Large 4 Oz (120 grams) lidocaine TOPICAINE skin numbing cream gel will last for repeat treatments when required. Also available in 1 Oz (30 grams) and 1/3 Oz (10 grams). Child resistant caps, sealed for your protection, and manufactured in the US on a FDA certified laboratory. TRY IT RISK FREE! We aim for your total satisfaction or your money back. If you aren’t absolutely satisfied, return your product within 90 days for a prompt and courteous refund. On your next cosmetic medical or beauty appointment, take a vacation from pain! 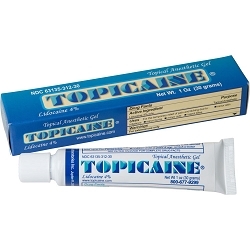 TOPICAINE® topical anesthetic gel is guaranteed to numb your skin and increase your comfort. TOPICAINE® is a non-oily, translucent gel containing lidocaine 4% in a microemulsion with skin permeation enhancers and soothing agents. 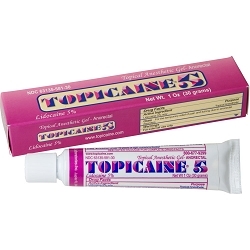 Also available in a 5% lidocaine concentration, TOPICAINE® 5, also a gel. This is the maximum concentration allowed by FDA for an over-the-counter (non-prescription required) skin numbing agent. It is a TOPICAL ANESTHETIC specially formulated to penetrate intact skin, for the relief of pain. It is a skin numbing agent with lidocaine as its active ingredient. Physicians and esthetic professionals use this skin numbing gel for a number of medical and beauty treatments (these are off-label uses). Check with your physician or nurse practitioner to see if TOPICAINE® use is appropriate for your particular case and application. TOPICAINE® 5 has lidocaine 5% in a gel with label indication: for anorectal pain. HOW NUMB WILL MY SKIN GET? "TOPICAINE® demonstrated a very rapid onset with a long duration of cutaneous anesthesia in a prospective, randomized, double-blind, controlled study investigating the efficacy of EMLA®, LMX-5® and TOPICAINE® using a 30-minute application time." This was and independent clinical study conducted at the Department of Dermatology of New Your University. TOPICAINE® showed the highest level of anesthetic efficacy overall. The effective skin numbing action of TOPICAINE® allows you to concentrate on getting results, not on enduring pain. You won't be cancelling your next appointment because of the dreadful pain. TOPICAINE®'s numbs the skin with rapid onset and proven efficacy. Independent clinical studies found it that TOPICAINE® (with lidocaine 4% ) reduces pain better than LMX-5 (with lidocaine 5%) and prescription cream EMLA (which has a combination of 2.5% lidocaine and 2.5% prilocaine). The explanation for this is that TOPICAINE® is formulated in a penetrating vehicle, with skin permeation enhancers that facilitate the delivery of lidocaine to where it needs to act. HOW FAST IS THE SKIN NUMBING ACTION? 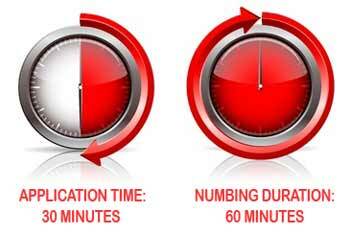 Excellent skin numbing results are obtained 30 minutes to 1 hour post application. Give the product time to penetrate the skin, that way you obtain the most benefit from it. Please don't fall for other products that promise "instant numbing", it is just not true. That said, some areas of the body numb faster than others. For example, if you put some of the gel on your lips (the red part), you will feel numb - really numb - in less than ten minutes. That is because the skin there is very permeable. Try it yourself, once you get the product, and you will believe it! However, most other areas of the body take more time, because the skin elsewhere is thicker, with many keratinized layers that act as a barrier. TOPICAINE® is formulated to overcome this barrier, because it contains skin permeation enhancers. These are substances that temporarily and reversibly increase the permeability of the stratum corneum - the skin barrier. In addition, the product needs some time to penetrate to where the pain receptors are located, deep into the dermis. In some areas, like the lips, the numbing action can be felt much faster because the nerve receptors are located very superficially. Most other locations of the body the receptors are located deeper, and it takes longer to reach them. If the application time is 30 minutes, the skin numbing effect will last approximately 1 hour. If you apply the product for 1 hour, your skin will remain numb for about 2 hours, even after you remove it! HOW THICK SHOULD I APPLY TOPICAINE®? "Being a medical physician who has performed thousands of skin treatments over the past 10 years, I would like to share that am highly satisfied with TOPICAINE®. Its effectiveness in reducing pain and discomfort is such that my patients have expressed their gratitude and thanks to the makers of TOPICAINE® on countless occasions." "I highly recommend TOPICAINE® to other medical professionals; TOPICAINE® is one of the best topical anesthetics on the market today." Apply a moderately thick layer to the affected area (approximately 1/8 inch thick). That is like the thickness of a penny. That way, you insure there is lidocaine available to penetrate the skin during the whole application time. If you apply a very thin layer, there may not be enough lidocaine to obtain the desired effect, and the numbness will not be deep or last long enough. Also, a thick layer occludes the skin and traps the skin's own heat and moisture, which also facilitates the delivery of the anesthetic into the skin. Forgive me for repeating this: please allow time for numbness to develop. Best results are obtained 30 minutes to 1 hour post-application. The longer the application time, the deeper the numbing. TOPICAINE® wipes clean easily from your skin. Does not interfere with laser, electrolysis, permanent make up or tattooing procedures - other than keeping the skin numb and increasing your comfort. 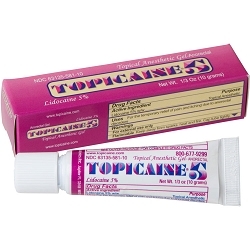 TOPICAINE® 4% contains lidocaine 4% formulated in a cooling, penetrating gel composed of water, ethanol, glycerin, jojoba oil, aloe vera oil, glyceryl monolaureate, benzyl alcohol, carbomer 940 and EDTA. TOPICAINE® 5% has almost the same composition as TOPICAINE® 4%, except it contains more lidocaine, 5%, and the gel contains two additional ingredients: shea butter and alpha bisabolol. These are extra soothing ingredients for the skin, and give the product overall more of an occlusive effect to enhance delivery. 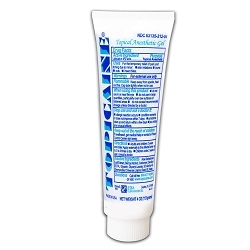 TOPICAINE® is an over-the-counter skin numbing gel. In addition to being sold online, it is available through physicians (especially dermatologists and plastic surgeons), aesthetic professionals (electrologists, permanent make-up artists, tattoo artists), at waxing salons, laser hair removal clinics, laser tattoo removal clinics and through selected pharmacies (please call your pharmacy for availability). Do not cover large areas of the body. TOPICAINE® is not recommended for use on mucous membranes because of much greater absorption than through intact skin. Do not use on broken or inflamed skin. TOPICAINE® is not recommended for use beyond the external ear. Read all the medical information. For more information, please read all the frequently asked questions. The following are resources that are not affiliated with ESBA Laboratories but we found them informative and useful. Hope you too! It is no secret that epilators cause pain. This blog by Denisa Cinca is loaded with useful tips and information on epilators and other hair removal methods.